Warranty conditions offered by Reggiani S.p.A. Illuminazione for the supply of products that use a LED LUCE light source. Because Reggiani products have such a high standard of quality, the company can offer a five-year (5) contractual warranty. This warranty applies to REGGIANI products that use a LED LUCE light source, and it is limited to the LED light source and control gear technologies. defects which exceed the nominal failure rate of 0.2% per 1,000 hours of use. the customer has made regular payment for the product in compliance with the agreed terms of payment. Defective products must be sent to Reggiani Illuminazione within 10 days after the malfunction is discovered, or this warranty will be null and void, and the costs of the shipment will be the customer’s responsibility. The customer is responsible for the costs of disassembly and reassembly. Any costs incurred to access the installation site (for example, mobile scaffolding, lifts, opening up areas during evening hours, third party assistance) are the customer’s responsibility. The warranty which Reggiani S.p.A. Illuminazione offers the CUSTOMER for REGGIANI products that use a LED LUCE light source, has a validity of five (5) years. 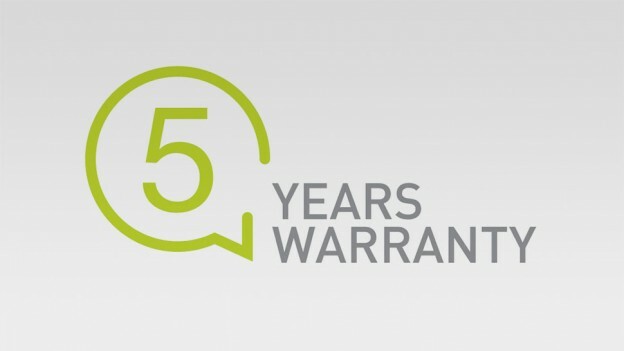 To ensure that the product warranty coincides with the manufacturer’s warranty, the warranty is extended for an additional 6 months from manufacture date indicated on the product, up to a maximum of 66 months after the manufacture date. This date can easily be identified on the product label. Beyond 30,000 hours of operation, this warranty covers only the LED LUCE light source, provided it is verified that output is greater than 65% of nominal value. luminaires installed in systems without protection against power surges of any kind (for example lightning). Systems with more than 30 luminaires on the same line (Phase – Neutral). If the system has a 2- or 3-pole upstream circuit breaker, the maximum number of luminaires must be reduced by 20% or 30%, respectively. The contractual warranty set out herein is effective only if the customer submits a written complaint to Reggiani S.p.A. Illuminazione, to be sent by registered letter with advice of receipt, no later than eight (8) days after the luminaire begins to function poorly, or it will be null and void. In order to avail himself of the contractual warranty provided here, the CUSTOMER must provide proof that he has complied with the above conditions. The warranty is offered to the END CUSTOMER and is valid for the first installation of the luminaires. Subsequent installations of said luminaires are not covered by this warranty. Defects in the luminaires will be evaluated by Reggiani Illuminazione, which will have sole discretion to determine whether they are covered by the warranty conditions set out herein. A consumer who avails himself of the warranty will have the right to either replace the luminaire completely or to replace only the power drivers, if the malfunction involves that component. Reggiani Illuminazione reserves the right to replace a defective product with another product with a similar design and the same or better performance, or to refund the customer for the purchase price. Replacement products retain the terms of the original warranty. The costs of labor to replace luminaires are not covered, nor is any damage, even if only indirect, connected to the luminaire’s defect. No agent, distributor or dealer is in any way authorized to change, modify or extend the terms of the warranty on behalf of Reggiani Illuminazione, under any circumstances. At Reggiani’s request, non-conforming or defective products will become the property of Reggiani as soon as they are replaced. The application, interpretation and all questions pertaining to the validity and effects of this contractual warranty shall be determined and governed by Italian law. Any and all disputes in any way related to this warranty or connected or related to it shall be subject to the exclusive jurisdiction of the Courts of Monza. Pursuant to and for purposes of articles 1341 and 1342 of the Italian Civil Code, the clauses set out in the following articles: 2 (warranty conditions), 3 (term and limits of warranty), 4 (exclusions), 5 (application of the warranty) and 6 (governing law – jurisdiction) are specifically approved.